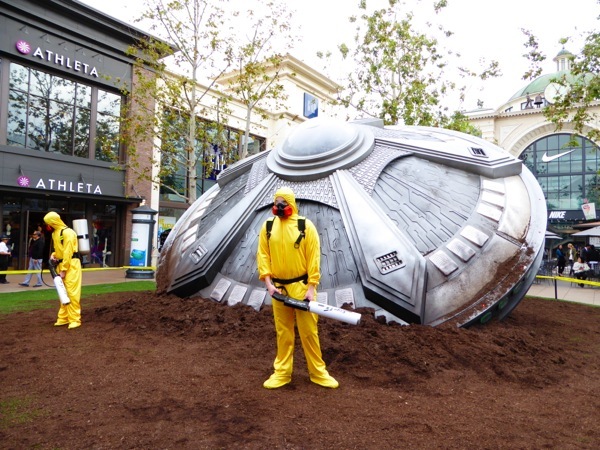 Do you still believe in aliens, paranormal phenomena and government conspiracies? 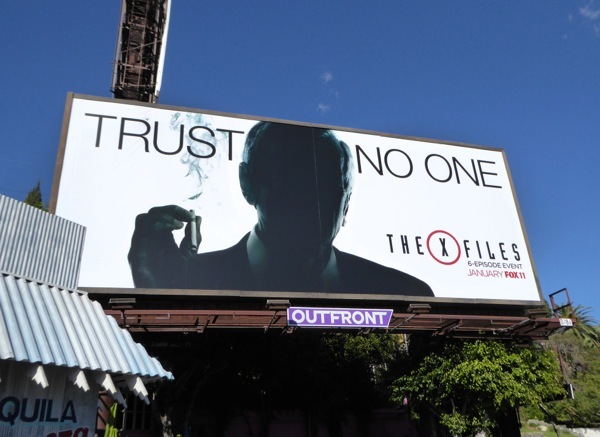 More importantly, do you still believe that The X-Files is a viable TV franchise? 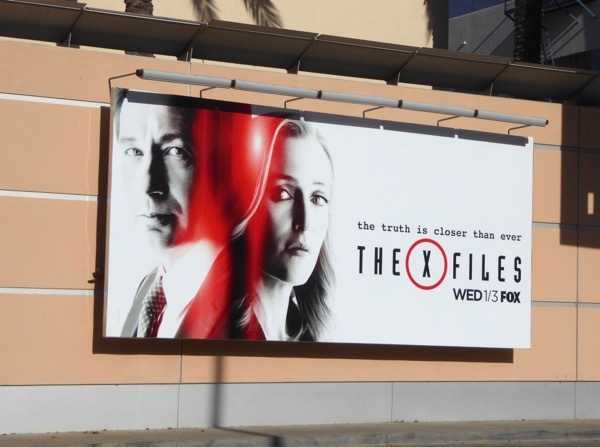 Fox obviously does, as after nine seasons from 1993 to 2002 and two spin-off movies, the pop culture phenomenon is being resurrected for a new mini-series at the start of 2016. 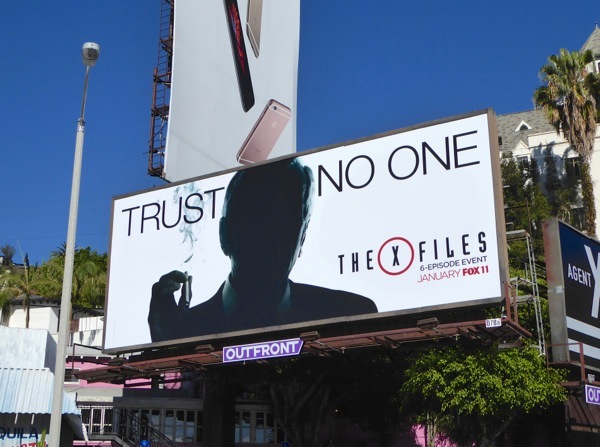 Yes, iconic FBI agents 'Fox Mulder' (David Duchovny) and 'Dana Scully' (Gillian Anderson) will be back on the small screen for six new episodes to investigate new mysteries and conspiracies, and by the looks of this teaser billboard, some of their old enemies will be returning too. 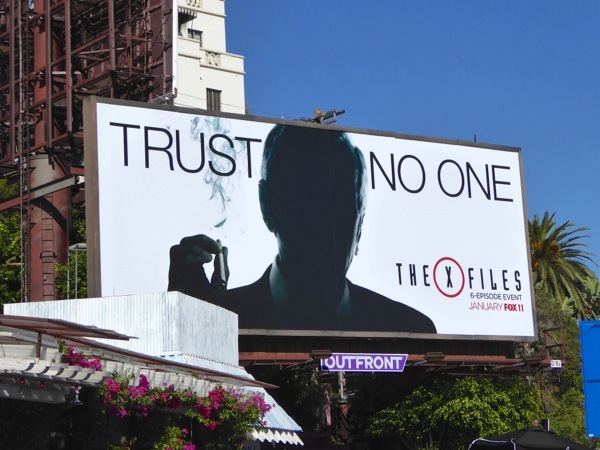 This 'Trust no one' teaser billboard featuring the shadowy 'Cigarette Smoking Man' was snapped along the Sunset Strip in West Hollywood on November 10, 2015. 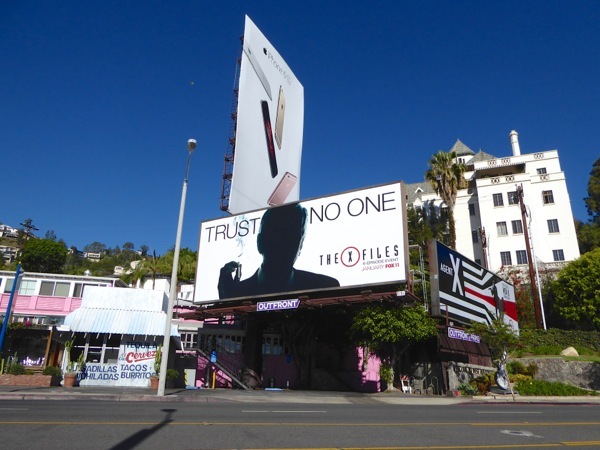 If you're a fan of David Duchovny, be sure to enjoy these Californication series billboards and this Aquarius TV billboard. 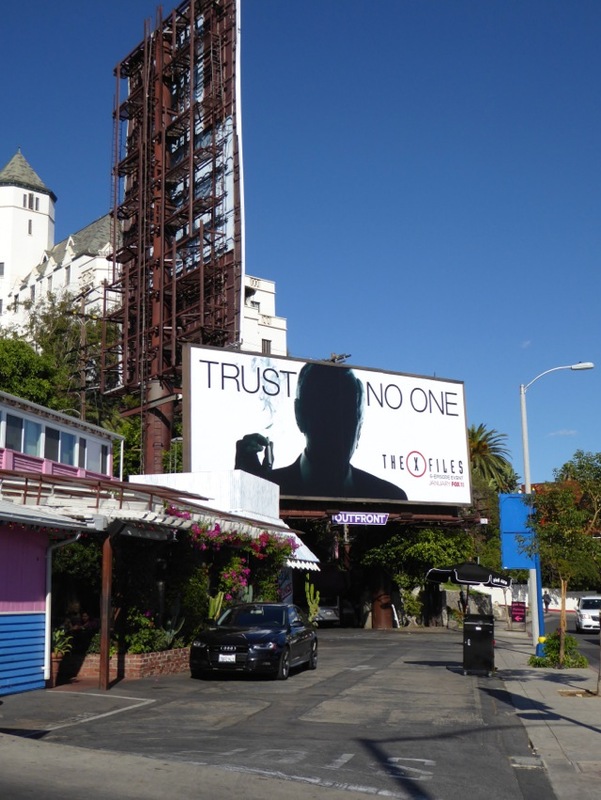 For another Fox revival event, you may also want check out this 24: Live Another Day mini-series billboard from last May. 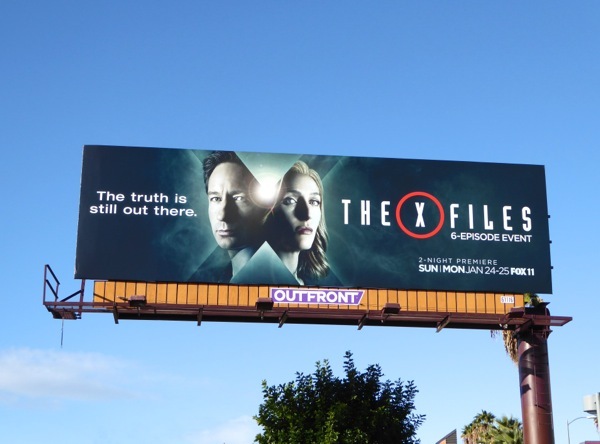 If this mini-series is a success, would you be interested in seeing The X-Files reopened? 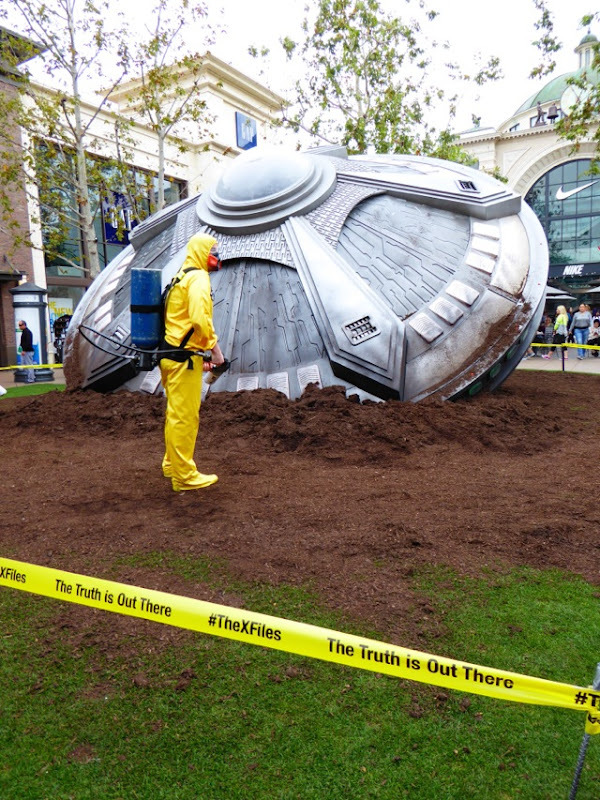 Do you still want to believe the truth is out there? 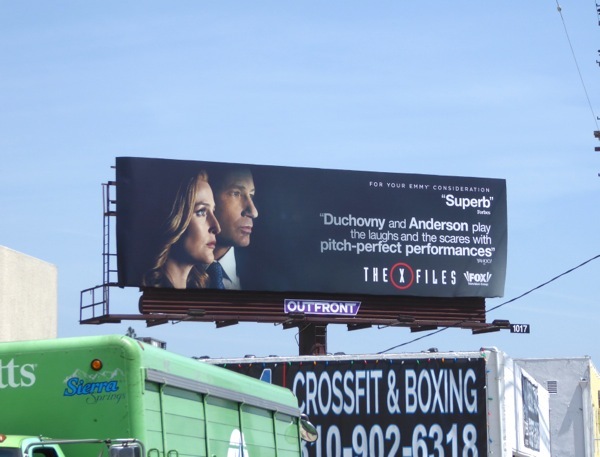 UPDATED: Now here's what we've all been waiting for, an ad creative featuring 'Mulder and Scully' themselves. 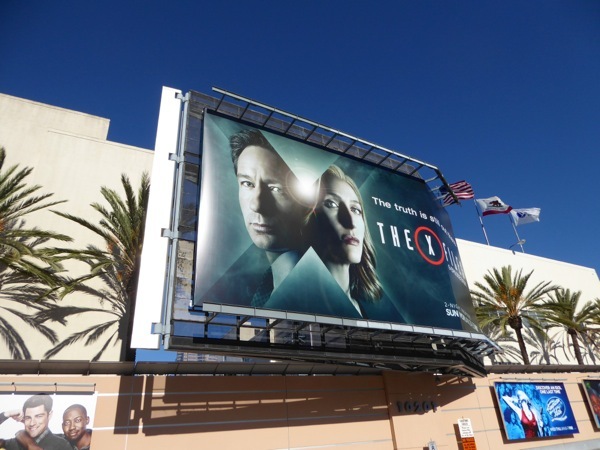 This impressive extra-large billboard for the 2016 TV event was spied adorning the entrance to Fox Studios along Pico Boulevard on December 12, 2015. Let's hope the dynamic duo still have their magic onscreen chemistry after all these years. 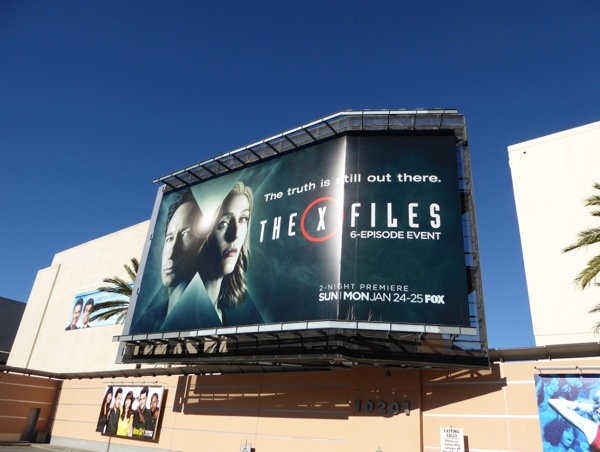 UPDATED: Here's also a standard landscape bulletin for the new mini-series snapped along Sunset Boulevard at La Brea Avenue on January 7, 2016. The pair still make a striking couple in the city skyline don't you think? Let the countdown to the two-night premiere on January 24 and 25 begin. 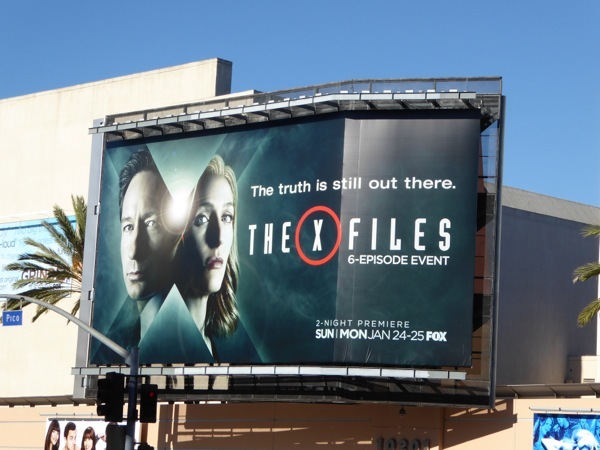 UPDATED: You know how much Fox wants The X-Files revival to succeed by how much money they are spending on out-of-home. 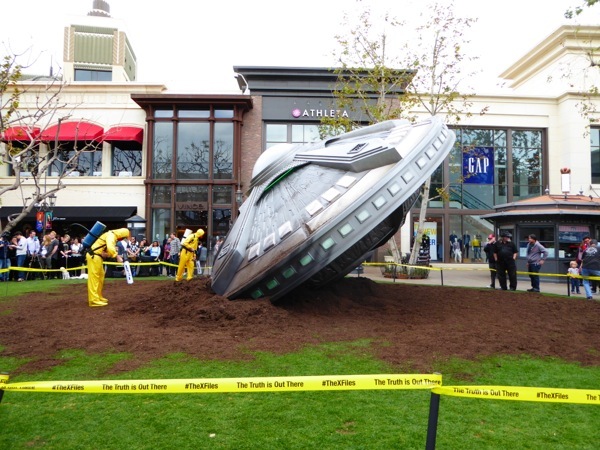 To highlight the mini-series debut they have this fantastic life-size crashed UFO embedded in the grass verge at The Grove shopping centre in L.A.
Photographed on January 22, 2016, the downed spacecraft, complete with smoke effects and human actors inspecting the extraterrestrial landing, is all part of the launch weekend for TV series, including special advance screenings, to get everyone excited for the new episodes. 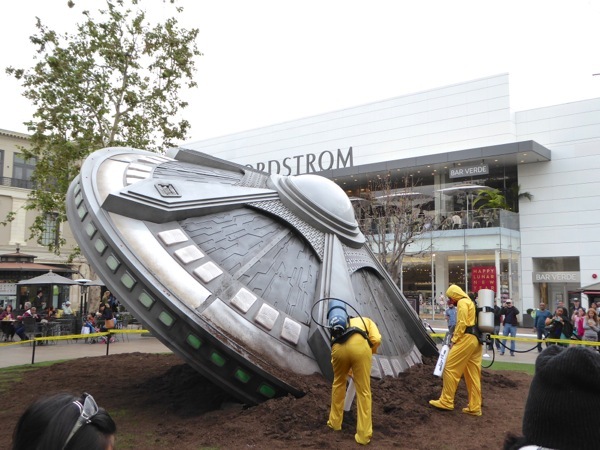 If you like this immersive, out-of-this-world spectacle, you may also like this 3D crashed UFO billboard for Rick and Morty when the animated series launched on Adult Swim back in 2013. 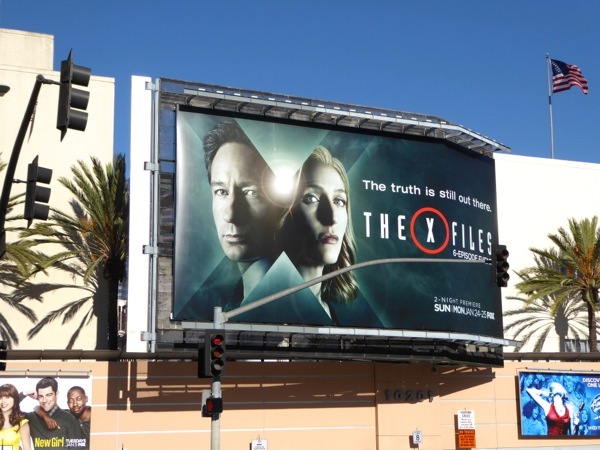 UPDATED: Let's see if the TV industry liked the return of The X-Files as much as the fans, as this Emmy consideration billboard for the new episodes was snapped along Sepulveda Boulevard in West L.A. on June 2, 2016. 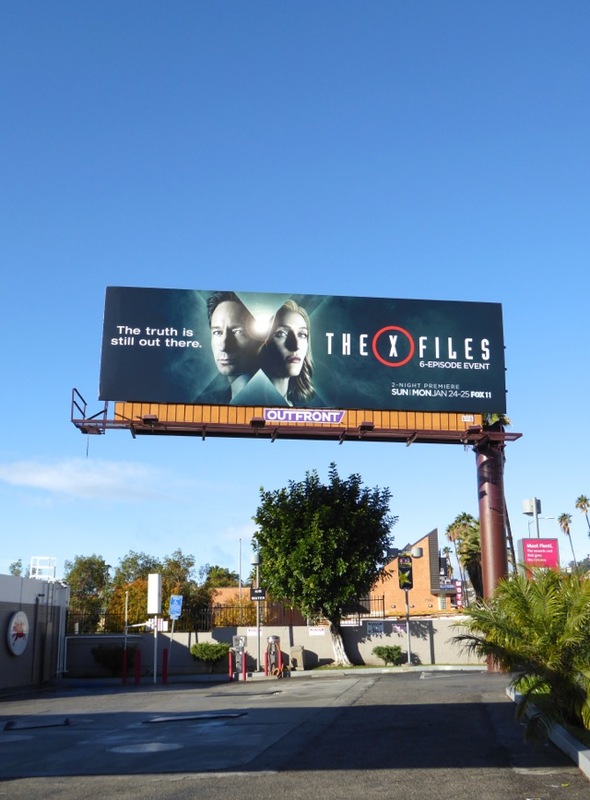 UPDATED: Here's also a season eleven billboard for The X-Files, spotted at Fox Studios on December 17, 2017.